Hello, it has been a rather exciting month in the Jones’ household, despite colds and a couple of chest infections for poor Willow (and a rather sleep deprived Mummy and Daddy). Yet this was not to deter us from going to the Point to Point at Hereford on the 3rd April. It was so good to see the race track full of life and full of people having so much fun. 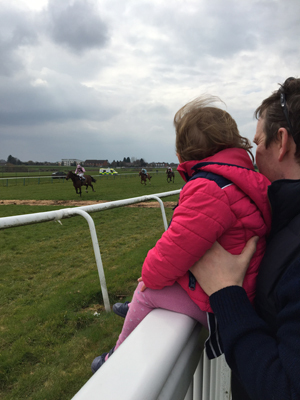 Willow loved seeing the horses and had to run down to the starting line to see the horses warm up and set off. She waved and blew kisses to the horses. One kind jockey saw this and said hello to her which made her smile lots. The Jones family has always had a lot to do with horses and I expect Willow will also follow in her Aunt, Uncle and Daddy’s footsteps and ride one day. It was a great day out and the maiden race was sponsored by Philip Morris & Son and so we were able to contribute to the day as well. Willow also had a rather special birthday this month, as she turned two on Sunday the 10th of April. I can’t believe she is now 2! She has come so far since arriving 9 weeks early and spending 53 days in Hereford SCBU (the care from which was amazing and we have nothing but praise for our local hospital). She is now catching up developmentally and you cannot tell she was so premature. For her birthday we spent the Saturday with her cousins, Emily and Jack and their parents, Auntie Nicki and Uncle John. Hubby and John managed to go the whole day without talking about work as well which just shows how much fun we all had. 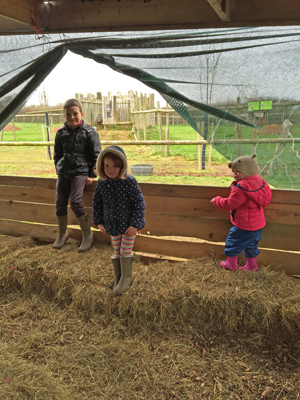 We spent the day at Newbridge Farm Park, where we saw all the animals, played in the sandpits and spent ages on the trampoline amidst fits of giggles and laughter. On Sunday we had a visit from lots of the family and Willow played with her other cousins. She wasn’t very good at opening presents but I expect that to change in future birthdays but she loved her birthday cake and blowing out the candles. Her cake was a massive stress for me. I am not much of a baker but she wanted a monkey cake. The result looks more like Fossie bear from the Muppets but it tasted lovely. We have a lot more adventures planned for the coming months and are hoping to spend a lot of the weekends outside so Willow can play in her new playhouse with the dogs who are of course, a girl’s best friend. We just need the weather to be nice! Birthday Celebrations, Birthday Girl, Cake, hereford, Herefordshire, Horse Racing, Philip Morris And Son, Point To Point, Spring. Bookmark.